The signing of the S-400 air defence missile deal with Russia was not quite a proud moment. 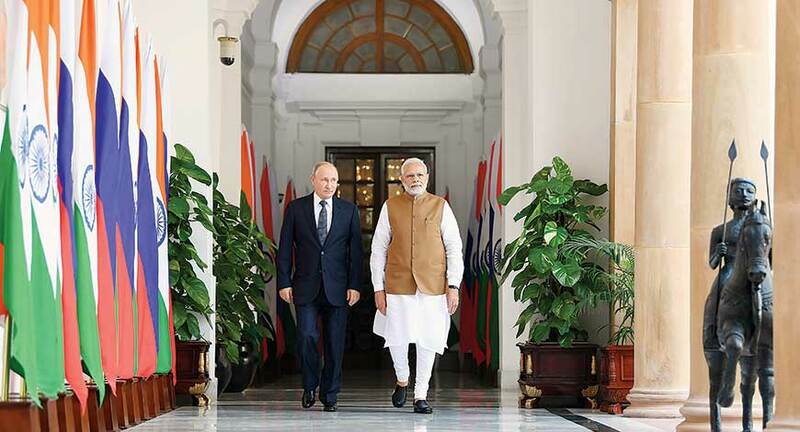 A joint statement issued after the talks between visiting Russian President, Vladimir Putin and Prime Minister Narendra Modi confirmed the $5.4 billion deal, but barely outlined its contours. The threat of CAATSA (Countering America’s Adversaries Through Sanctions Act) looms large over India. A day before Putin’s arrival in India, the United States had hinted of punitive sanctions and warned that S-400 was a “focus area” of secondary US sanctions against those who had made “significant” military hardware purchases from Russian establishments. The State Department said India’s decision to continue buying oil from Iran after November 4 and purchase the S-400 Triumf air defence system from Russia was “not helpful” and that the US was reviewing it “very carefully”. But old school guards are back in business, celebrating the traditional bonhomie with Russia and cheering the independent stance taken by Emerging India. There is no going back on India’s relations with Russia now, but it is not a moment of triumph. We are doling out a couple of billion dollars to procure military hardware from Russia at the cost of losing out on trade exchanges with the US. With bilateral trade thriving at $126 billion in 2017, the United States is India’s top export market. In the April 2017 to March 2018 financial year, India’s exports to the US touched $47.9 billion, or 16 per cent of India’s total global trade. Take note of all the current economic indicators - the size of bilateral trade and investment, strength of migrant workers, destination of India’s information technology (IT) services - the US is the place and the partner for India’s growth story. 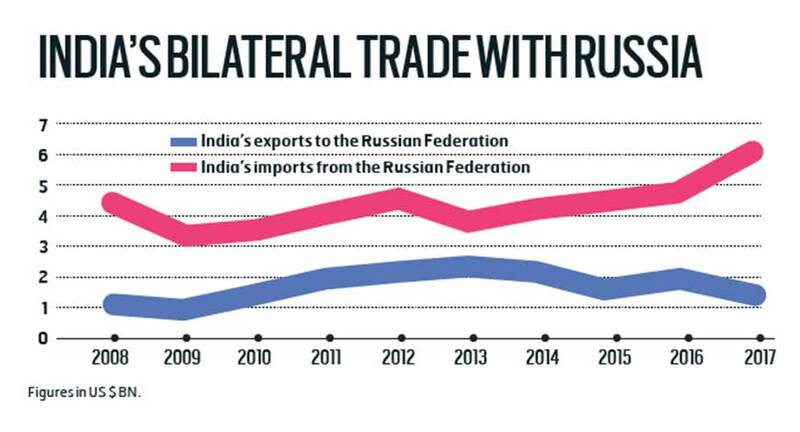 On the other hand, India-Russia bilateral trade was only $10.17 billion in 2017. The fact that just five years ago, Russia’s GDP was 20 per cent larger than India’s and that in 2018, India’s is 70 per cent larger than Russia’s, gives us a sense of direction. Russia’s cumulative investments into India were as low as $ 1.2 billion between 2000 and 2017. 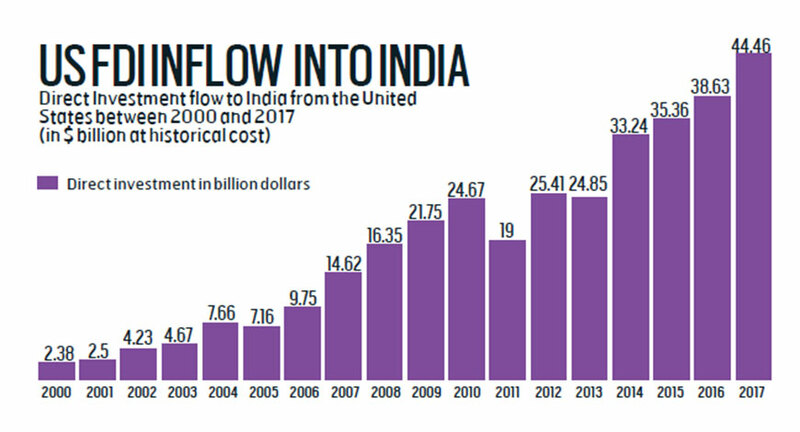 In the three-year period between 2015 and 2017, US investment in India has been $118 billion (please see chart, US FDI inflow into India). What is at stake here that we should not ignore? With an operational range of 400 km and active radar homing, the S-400 Triumf is certainly the most advanced military defence system. In 2016, India and Russia had signed an agreement on the ‘Triumf’ interceptor-based missile system which can destroy incoming hostile aircraft, missiles and even drones. China was the first foreign buyer to seal a government-to-government deal with Russia in 2014 to procure the lethal missile system. Moscow has already begun delivering an unknown number of the S-400 missile systems to Beijing. Even so, the S-400 Triumf agreement is not as significant for India as it is for Russia. Prime Minister Modi’s meeting with Putin at Sochi focused on areas of convergence and endorsing the importance of the Special and Privileged Strategic Partnership for global peace and stability. For Russia, a share of the Indian defence market is equally important. Vladimir Putin, still in the early months of his fourth presidency, finds himself faced with familiar problems. The rouble has depreciated 25 per cent against the US dollar since January 2016, economic expansion is predicted to average at just 1.5 per cent over the next five years, and the part of the population living below the poverty line is at 14 per cent. The oil and gas industry accounts for over 60 per cent of Russia’s exports and contributes to 40 per cent of Russia’s federal budget which is not surprising, considering that it is among the top three oil-producing countries in the world. Having failed to use these funds to boost other sectors and diversify its economy, Russia is now at the mercy of oil market gyrations. Its second big ticket sector is defence, where Russia is the world’s second-largest arms exporter after the US. Russia’s two largest customers, China and India, together responsible for 56 per cent of its arms exports between 2000 and 2016, happen to be in Asia. India has been a lucrative market for arms exporters in recent years, accounting for 13 per cent to 15 per cent of global arms purchases between 2000 and 2016. 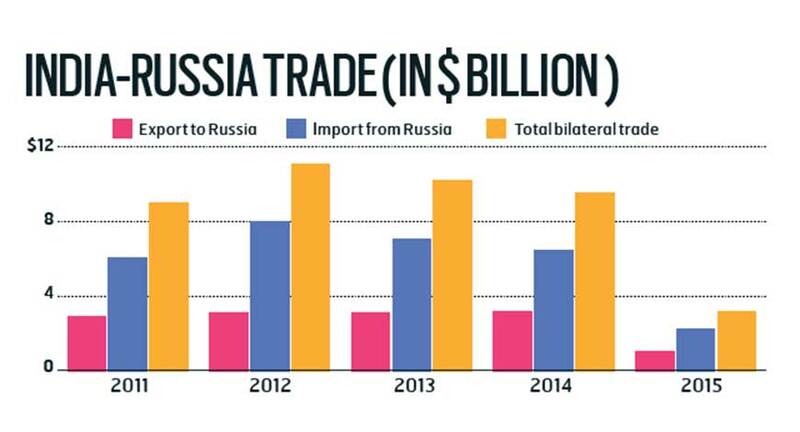 As much as 72 per cent of these imports have been from Russia, accounting for a whopping 30 per cent of Russia’s arms exports – making India’s share the single largest of any country. Sustaining a large share of the Indian market is, therefore, of immense importance to Russian arms manufacturers. Commenting on the inevitability of Russia’s dependence on India, Dhruva Jaishankar, Fellow of Foreign Policy Studies at the Brookings Institution in Washington DC says, “India’s defence imports have reduced by about 60 per cent, India is still dependent on Moscow for supplies, maintenance, and certain critical technologies that the US is unable to provide.” He points out though that, “at the same time, India is concerned about Russia’s closer relations with China and Pakistan.” The Russian stance became explicit at the informal summit with Prime Minister Modi and President Putin at Sochi, when Russian Foreign Minister, Sergey Viktorovich Lavrov, referred to the region as Asia-Pacific in his media address, using a Chinese coinage. The US meanwhile, has referred to the region as the Indo-Pacific, putting India at the centre stage of this strategic region. At this juncture, Indo-US trade in goods and services is an estimated $126.2 billion for 2017, compared with an abysmal $10 billion with Russia. 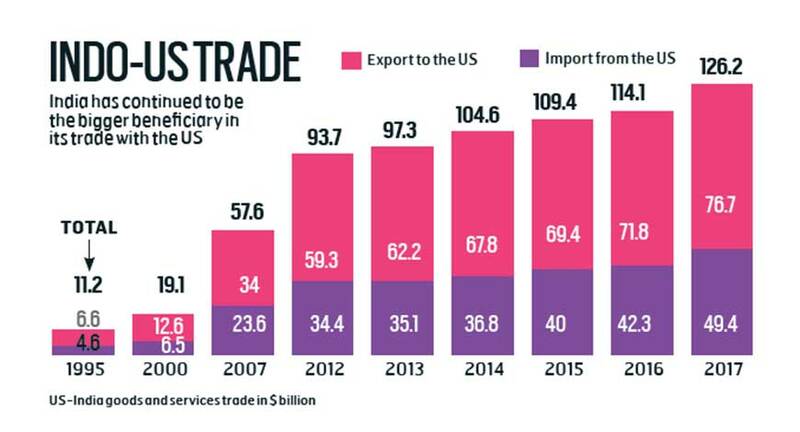 The total bilateral trade (goods and services) between India and the US increased at a CAGR of 11.4 per cent from $20 billion in 2000 to over $126.1 billion in 2017. 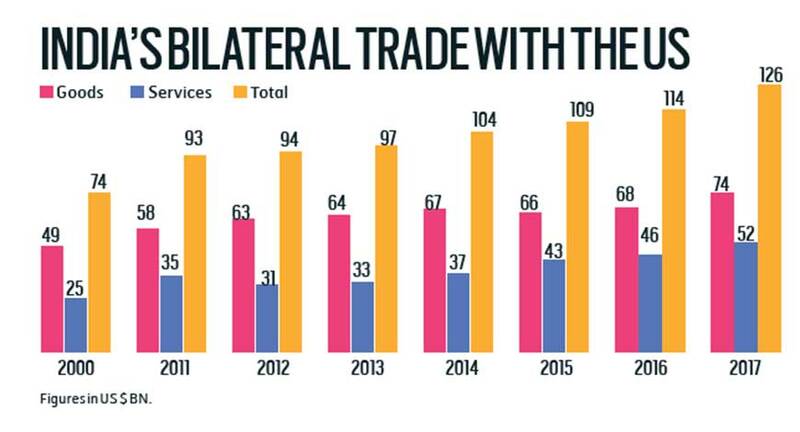 In services, in which India has a big stake, bilateral trade has grown at a very fast pace since 2000, increasing from a mere $6 billion in 2000 to $51.8 billion in 2017 (a CAGR of 13.5 per cent). Beyond the big number, let’s see the flow of ideas and people, which is a more realistic and tangible index to work upon. Where is the Indian workforce headed in pursuit of academic excellence or innovation. According to an official report, the number of Indian students in the US increased to 1,86,000 hitting double-digit growth for the fourth consecutive year in a row. This is an increase of 21,000 over last year and a growth of 12 per cent, one of the highest rates of growth in the world. For India’s $150 billion-a-year IT industry, the US is a vital market. Defence cooperation is not off-track with the US anymore. The recent 2+2 India-US Dialogue is the centerpiece of talks. The signing of the long-awaited Communications Compatibility and Security Agreement (COMCASA) will enhance bilateral defence partnership and give India access to advanced US defence systems. Look no further than the Indian Ocean, where China’s activities provoke closer cooperation between India and the US in the maritime domain. “The geo-politics has changed so much in the last few months, geo-economics is also changing rapidly. In this context, I see a clear defined role and responsibility for US-India to work together not just for our mutual benefit, but also for the benefit of the rest of the world,” Prabhu had said. China’s One Belt and One Road Initiative (BRI) is projected as a commercial initiative and is financed from surplus capital, but has begun to establish an infrastructure network that has already changed the security environment around India. Russia is an enthused partner in the BRI. China has invested at least $900 billion (£635 billion) in projects along the Belt and Road, mainly in infrastructure, transport, and energy. When all the trade routes lead to China, an emerging economy like India may feel stuck in a time warp. The situation could be salvaged through the India-US partnership and relations with friendly nations like Japan and Australia. These prospects could get jeopardised should sanctions hit India. “US-India relations have overcome sterner tests in the past,” points out Jaishankar. “India can delay payments on the S-400 to postpone the prospect of sanctions. In the meantime, there are several major defence deals with the US in the offing which may be reason enough for the Trump Administration to grant a waiver to India,” says he. Even so, India needs to build blocks and strengthen relations with the US, even as it keeps traditional allies networked. As far as India’s foreign policy is concerned, much is at stake.